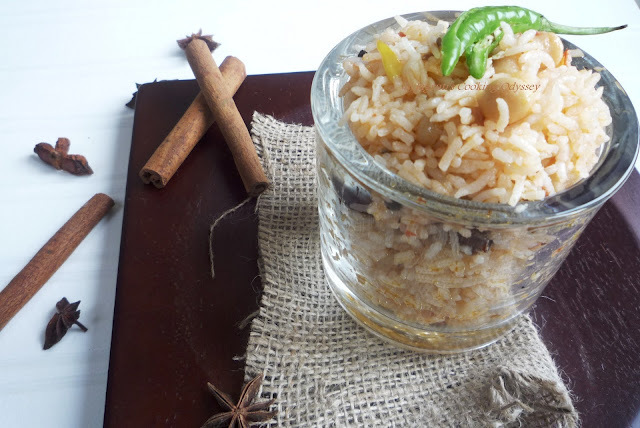 Today I will present to you Chana Rice, a delicious rice with chick peas. Wash the rice with cold water and put it a side to soak for half an hour. Heat the oil in a heavy bottom pan or kadai, add the sliced onion and fry until light brown. Now add all the whole spices and green chillies. After 2-3 minutes add chopped tomatoes and boiled chick peas, cook for another 3-4 minutes. Add soaked rice without water and mix well. Now add 1 cup of hot water and salt and lower the heat. Cover with the lid and cook rice until tender. If needed, add another 2-3 tsp water and keep cooking the rice. Now add cumin seeds and cover the rice again with a lid. Now simmer the rice 3-4 minutes on a very low heat. Turn the heat off and leave the rice cool for 5 minutes. Serve with yogurt, pickle and papad and enjoy! I am a housewife and a mother of two teenage kids settled in the UK for the past 20 years. Originally born and brought up in India, it was from these childhood days that my love for cooking began. I have no formal training in cooking and baking, and everything I’ve learnt has been through good cooks in the family and my circle of friends, through my own experiments, reading and research. My main cooking niche consists of healthy and tasty vegetarian meals but I like to throw in the occasional treat. To share my love for food and culinary art, I have created a food blog, Jagruti’s Cooking Odyssey that displays authentic Indian vegetarian/vegan dishes, special and rich recipes covering different courses in varied cuisines. My cooking enthusiasm led me to cookery shows on a national Asian TV channel. Much like cooking and baking I have other interests too like photography, reading and travelling, which assist me in my culinary skills. Tagged asian food, food, recipe. Bookmark the permalink. My mother cooked a similar dish when I was a child. This recipe brings back happy memories. Will definitely be trying it out!